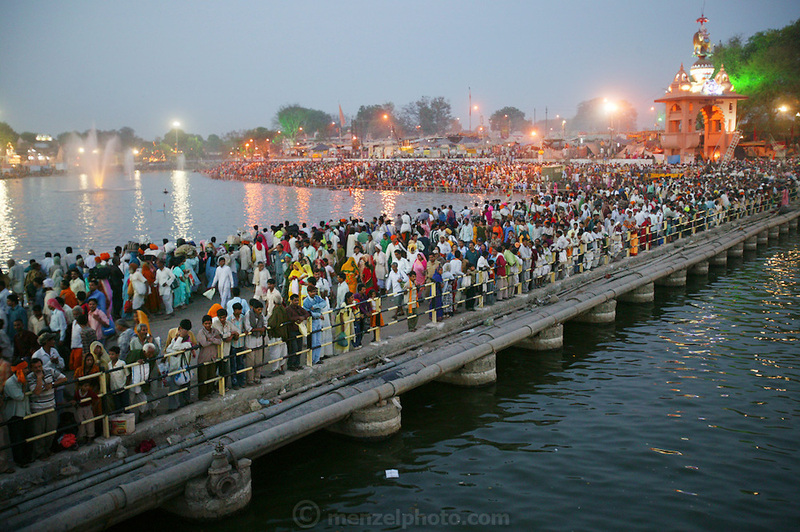 A crowd gathers before dawn on a bridge over the Shipra River which flows through the holy city of Ujjain, in the central Indian state of Madhya Pradesh during the Hindu festival of Kumbh Mela. Every 12 years, millions of devout Hindus celebrate the month-long festival of Kumbh Mela by bathing in the Shipras holy waters. Hundreds of ashrams set up dusty, sprawling camps that stretch for miles. Under the watchful eye of police and lifeguards, the Patkar family of Ujjain, India join the faithful throng in the cool of the evening and bathe in the river, too. Hungry Planet: What the World Eats (p. 169).